General Rubber is proud to offer extensive testing capabilities including hydrostatic, vacuum, and burst testing, as well as spring rate, movement capabilities, cycle life, and fatigue testing. We can also provide material testing at ambient and elevated temperatures. Using CAD and FEA we designed and built a new hydrostatic test rig, allowing us to automate much of the test setup. As a result, we are able to test more products quicker, using less labor, all while maintaining quality and reliability. Additionally, General Rubber built a custom spring rate testing rig, allowing us to generate data to validate spring rate information relative to our own engineering best practices, as well as industry methodologies highlighted by FSA and EJMA. General Rubber is leading the industry in developing customized nondestructive evaluation (NDE) baseline and field testing processes. 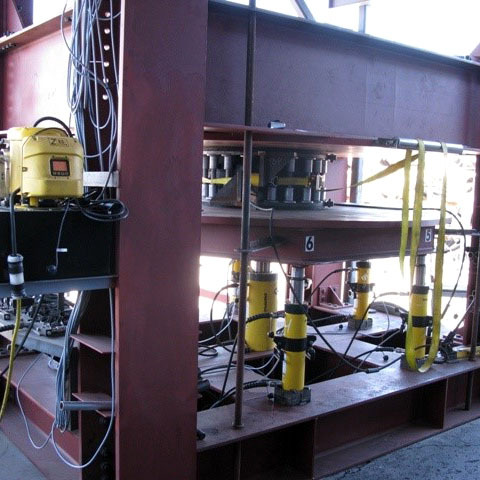 We can design and manufacture flexible test rigs or ones specific to customers' needs. In addition to product testing, General Rubber ensures the engineering properties and chemical quality of its elastomers through a number of standardized testing methods specified by the American Society for Testing and Materials (ASTM). Several of these tests are performed annually to guarantee the continued performance of our advanced products, while other tests are performed on every batch. In accordance with ASTM D2000—which calls out specific test methods qualifying and quantifying material performance—the below standards represent test methods required to satisfy material performance qualities set by industry best practice. We can provide detailed material characteristics, along with testing results, to certify our products meet these exceptional quality standards. As part of our commitment to quality we have produced guideline specifications which call out these testing standards, as well as other quality control measures, ensuring specified products meet the level of performance necessary for even the most demanding applications. General Rubber is proud of its commitment to quality management and has been offering advanced and custom testing capabilities, as well as performance products, for over 65 years. Please contact us for more information about our testing capabilities, or with your specific testing needs.